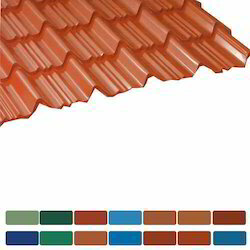 Leading Wholesale Trader of color coated profile sheet, color coated tile sheet and colour coated galvalume sheet from Kanpur. For the purpose of making the finest Color Coated Profile Sheet available to our clients, we engage in the utilization of quality raw materials and advanced machines. Manufactured as per the set industry norms and guidelines, its quality never deteriorates. In addition, the offered range has been priced at the most affordable rate possible. Being amongst the leading providers and traders of this commendable range of Color Coated Tile Sheet, we put in our efforts to standardize its quality. Thus we acquire the products from vendors, who engage in using of quality raw materials and advanced machines, as per the set industry standards. Because of this, the product is known to have a fine finishing, unmatched strength and high resistance to corrosion. Marked at the best rate possible, the offered Colour Coated Galvalume Sheet are widely acclaimed and asked for in the market. For reasons of maintaining the quality of these products, the offered range is manufactured by highly trusted vendors, utilizing the finest raw materials and modern machines, in compliance with the set industry standards.